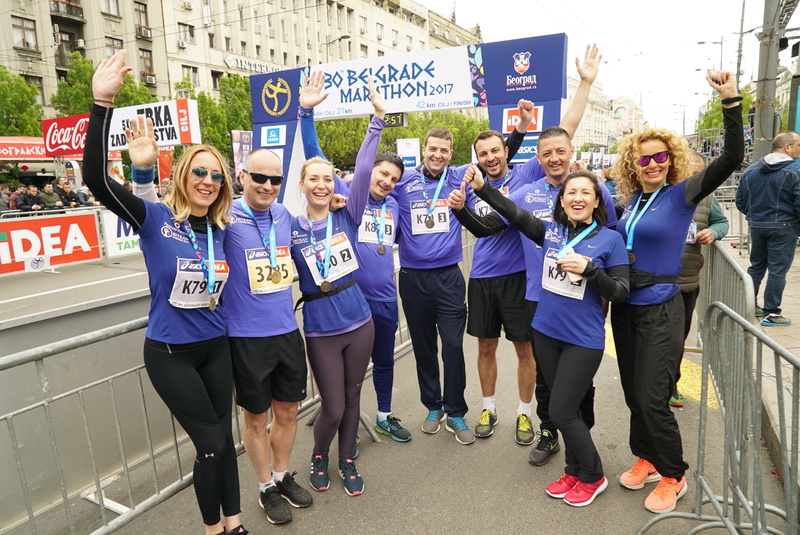 Pernod Ricard employees took part in Belgrade marathon, with a symbolic run to raise money for donation to Fund B92 initiative “Battle for Maternity Wards.” Thanks to this symbolic gesture of Pernod Ricard team, a hospital in Subotica will receive 3 CTG devices. This is the second year in a row for the company to donate equipment to the B92 Fund. Running two half-marathon relay and one marathon – 9 runners all together from 27 employees, Pernod Ricard employees joined forces to raise funds for this valuable donation, which will officially be delivered to the hospital in the upcoming period. Pernod Ricard hopes to save many young lives by donating to hospitals equipment that is lacking. Cardiotocography (CTG) is a technical means of recording the fetal heartbeat and the uterine contractions during pregnancy. The machine used to perform the monitoring is called a cardiotocograph. CTG monitoring is widely used to assess fetal wellbeing. “Battle for Maternity Wards” is a project launched by Fund B92 with a mission to help hospitals and medical centers in Serbia with necessary medical equipment. Battle for Maternity Wards will continue until all the maternity wards in Serbia are fully equipped and operational. Pernod Ricard has been historically commited to promoting responsible drinking, and has a long lasting culture of Sustainability & Responsibility activities. Pernod Ricard believes that, in order to avoid any risk, pregnant women must not drink alcohol at all and should be advised not to do so. As one of the founding members of the European Alcohol & Health Forum, created to implement the EU strategy to support Member States in reducing alcohol related harm, the Group Pernod Ricard has committed in 2007 to extend the logo dissuading pregnant women from drinking alcohol imposed by law in France in 2006, to all labels of our wine & spirit bottles it sells in the European Union. Then, in 2013, the company decided to extend the pregnancy logo worldwide which should be effective by 2017. The aim of this initiative is to raise awareness among pregnant women about the risks of alcohol consumption during pregnancy, but also to gain visibility among society to denounce drinking during pregnancy in order to eliminate beliefs that there is a level of drinking, which is considered as “safe”.